Faded Pinwheels pattern is 86 x 102 inches . It has clear directions printed in black and white along with a color front printed on cardstock paper. Pattern is held together with a metal brad paper fastener instead of a plastic bag. 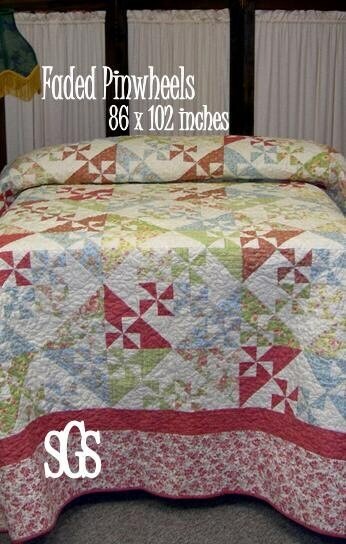 Pattern uses half-square triangles and soft prints for a cottage style quilt. Directions have been added for Layer Cakes. Really love this quilt design. Pattern is easy to follow and upon request, was adapted to use pre-cut fabric that I already had. Happy sewing!